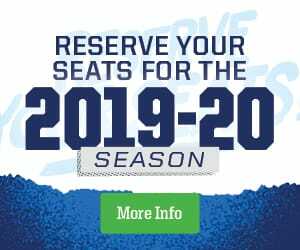 The Manitoba Moose (38-30-5-2) hope to end the 2018-19 season on a positive. 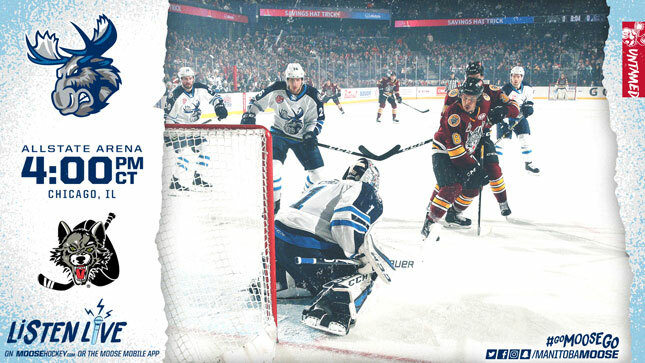 This afternoon they’ll take on the Chicago Wolves (44-21-6-4) at 4 p.m. CT at Allstate Arena. The game will be broadcast on moosehockey.com/listenlive/, the Moose App, or streaming live on AHLTV. The Moose went 27-14-3-2 since the holiday break (Dec. 30), but it still wasn’t enough to get the club into the Calder Cup Playoffs. Manitoba was officially eliminated from playoff contention with the 4-2 loss to the Wolves last night. Manitoba-produced skaters Cody Glass (1G, 1A), Keegan Kolesar (1G), and Zach Whitecloud (1A) powered the Wolves in their 4-2 victory over the Moose. Down 3-0 early in the third period, the Moose mounted a comeback that included power play goals from both Logan Shaw and Cameron Schilling. Despite outshooting Chicago 41-22, Manitoba couldn’t find a tying goal on Oscar Dansk. In the final minutes of regulation, the Moose outnumbered the Wolves with their goalie pulled, but a broken stick on the point, allowed Chicago to solidify the game on the empty net. Mason Appleton increased his seven-game point streak by setting up Schilling’s third period marker. Over his last seven games, Appleton has eight points (4G, 4A). The Green Bay, Wis. native has 32 points (15G, 17A) in 39 games. The secondary assist on Schilling’s tally went to Seth Griffith. The leading scorer on this year’s Moose, Griffith recorded his 40th assist of the season, a mark he’s only surpassed once previously in his six professional seasons. The Moose can even up the regular season series against Chicago with a win this afternoon, after setting a 3-4-0-0 record so far this season. Griffith’s assist was his ninth point (3G, 6A) against the Wolves in 2018-19. Kolesar scored into the empty net to secure his team a victory has six points (2G, 4A) against Manitoba this season, while Oscar Dansk is 4-2-0 versus Manitoba. Dansk made 39 saves last night, but Max Lagace is still looking for his first win against Manitoba, and could get a chance tonight. Don’t forget to tune in to moosehockey.com/listenlive/, the Moose App, or AHLTV for the live stream of today’s game, starting 15 minutes before the puck drops with Mitch Peacock and the pre-game show.